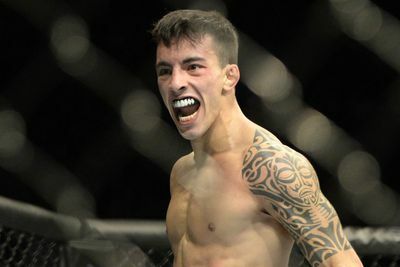 Thomas Almeida is for real. In front of a partisan Brazilian crowd the 19-0 bantamweight prospect was under tremendous pressure to deliver at UFC Fight Night 77 action tonight (Sat., Nov. 7, 2015) inside Ibirapuera Gymnasium in Sao Paulo, Brazil. And boy did he ever deliver. The fight began with spirited exchanges on both sides, with Anthony Birchak looking to carry the momentum of his upset win over Joe Soto at UFC Fight Night 68 into another battle where he was the clear underdog. The aggressive Birchak landed early and often, seemingly walking through the strikes of the devastating Muay Thai practitioner. The action was fast and furious in the first round, with several scrambles and opportunities. However, when the fight ended it came in dramatic fashion. Almeida hurt Birchak with a flurry against the fence, finishing the exchange with an absolutely brutal knockout reminiscent of Lyoto Machida’s knockout of Rashad Evans in 2009. Birchak’s legs buckled under him and he was already well into Never Neverland by the time his brain bounced off the canvas.